The path to marital happiness is different than you think. When our plans for marriage improvement begin with “If my husband would…” or “If, as a couple, we could…” we’re missing the secret. Despite her man’s flaws and failures, the Lord plans to bless a wife’s marriage through her husband. A Wife’s Secret to Happiness shares eleven powerful, practical blessings that God wants to pour into your lap like sweet spiritual confetti, and the wifestyle habits that will attract or reject this divine provision. Through thoughtful exploration of biblical promises, humorous hope-filled stories, and compelling testimonies, Jen shares how God empowers her life as a submissive millennial wife, and inspires readers to experience the same freedom. 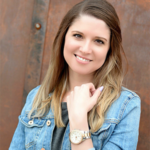 Jen Weaver is the author of A Wife’s Secret to Happiness and is passionate about sharing strength with others as a writer, Bible teacher, speaker, and blogger at thejenweaver.com. She’s also one of the hosts of The Declare Conference, a conference equipping women to walk in their calling as Christian communicators. A California transplant now loving small-town family life in Justin, Texas, Jen applies generous amounts of faith, caffeine, and dry shampoo to her daily life. Volunteering vulnerable stories of humor and hope from her twenty-six years in the faith, her words exhort a bold, empowered lifestyle that attracts God’s favor.